Historically, Liverpool Docks were once a trans-shipment point for cargo inward bound from all parts of the planet. 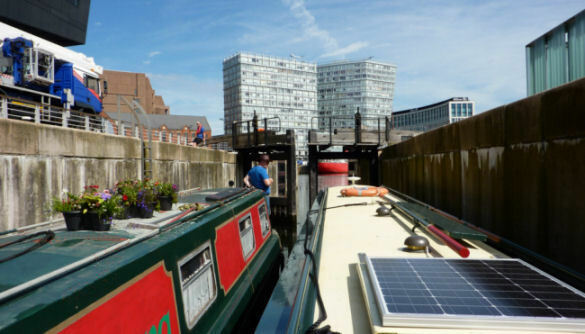 Cargo was unloaded from sea-going ships into barges and narrowboats for distribution throughout England's inland waterways network via the Stanley Dock Branch. 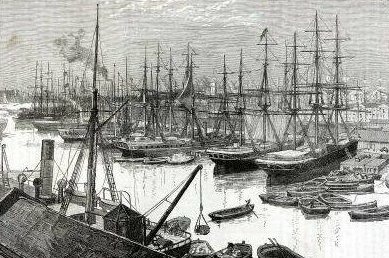 Domestically produced goods were delivered to Liverpool Docks via the same route and were loaded into ships for delivery to distant countries as well as more local coastal destinations. In later years this traffic was distributed not by canal boats but by rail and later by road. 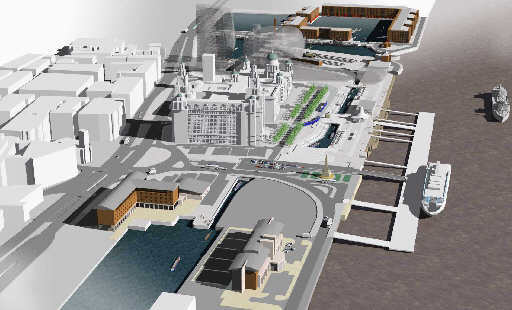 The need for building land at the Pier Head necessitated the in-filling of George's Dock and Basin which contained the navigable connection between the North and South Docks. 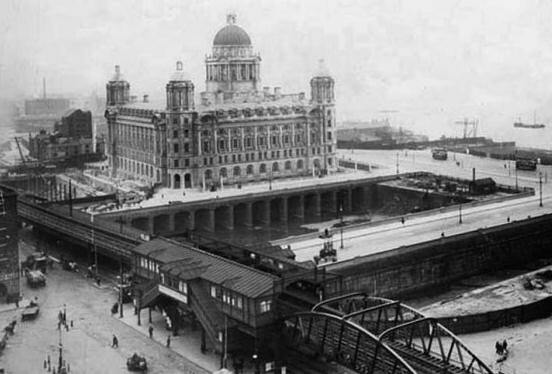 Consequently, in 1898 George's Dock and Basin were in-filled and the land reclaimed to accommodate construction of the Mersey Docks and Harbour Board Building with the Cunard and Liver Buildings following within the next ten years, thus completely severing the navigable link between the North and South Docks. 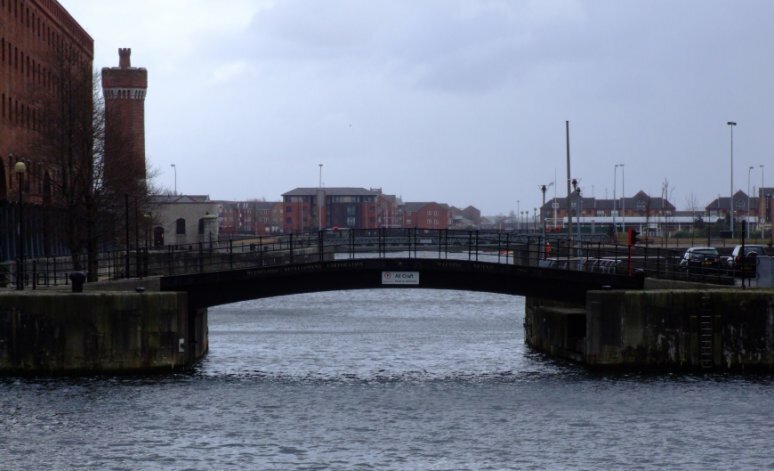 The original Liverpool terminus of the Leeds and Liverpool Canal was in Pall Mall, a mile or so past the entrance to the Stanley Dock branch (which gives access to the Northern Docks system) and the Tate and Lyle sugar refinery (where the Eldonian Village is situated today). At Pall Mall there there was a junction with a branch running close to the old Exchange Station whilst the main line of the canal carried on in an easterly direction beneath Old Hall Street, ending not very far from Prince’s Dock which is the dock nearest to the Liver Building at the Pier Head. Over the years, the main line of the canal has been nibbled away and in-filled. In 1987, with the closure and subsequent demolition of the canalside Tate and Lyle sugar refinery, the remainder of the route was in-filled back to the current main line terminus at the Eldonian Village Basin. 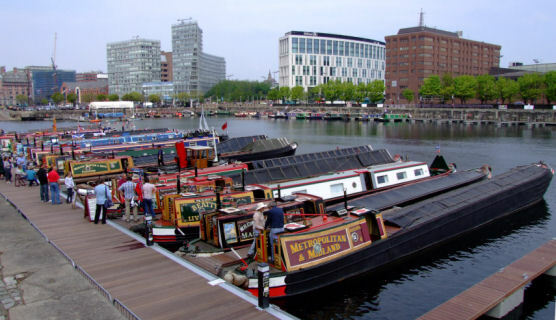 With the upsurge of leisure canal boating, more and more narrowboats and other types of canal craft were wishing to visit Liverpool's Albert Dock and the South Docks complex including Liverpool Marina. To do this they would have to cruise down the Leeds and Liverpool Stanley Dock Branch, cruise a mile or so downstream through the interconnected docks to Langton Dock where they would enter the River Mersey via one of the two operational locks which give river access to the North Docks. 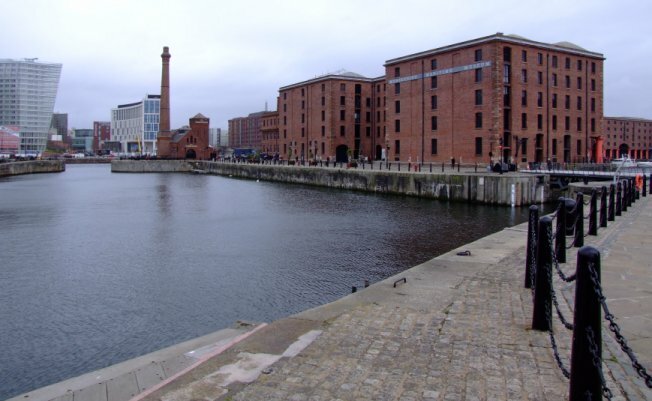 They would then cruise upstream, past the Pier Head (the narrowest part of the river where the tidal race is at its strongest) before entering the South Docks at Canning Half-Tide Dock, adjacent to the Albert Dock or further upstream to Brunswick Lock adjacent to Liverpool Marina. There was obviously a need for a safer and more direct route for canal craft not best suited to the fast-running, tidal waters of the River Mersey. 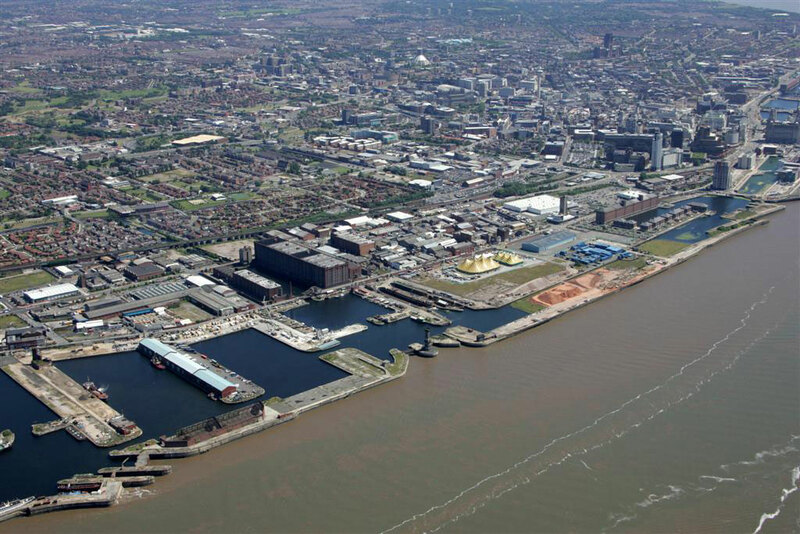 The owner and administrator of Liverpool Docks was originally the Mersey Docks and Harbour Board, later to become the Mersey Docks and Harbour Company. 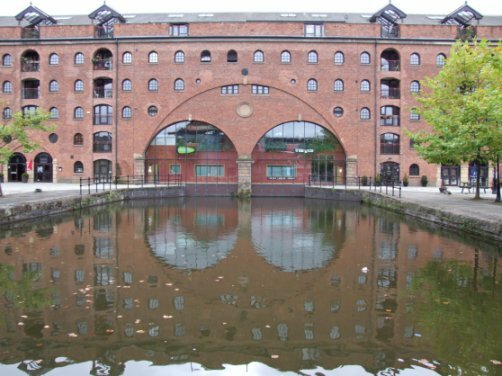 On the 22nd September 2005 Peel Holdings.… the owners of the Bridgewater and Manchester Ship Canals, the Trafford Centre, Liverpool’s John Lennon Airport and many other major property developments, bought the docks system. 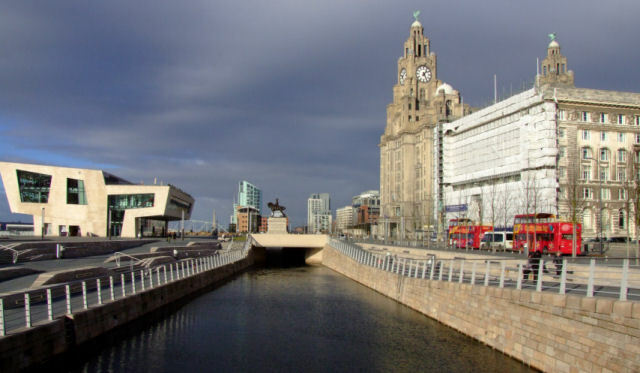 British Waterways (now the Canal and River Trust) first proposed to take over Liverpool Docks in 2000 and at that time the possibility of a new canal to link the North and South Docks known as the Liverpool Docks Link was first mentioned. 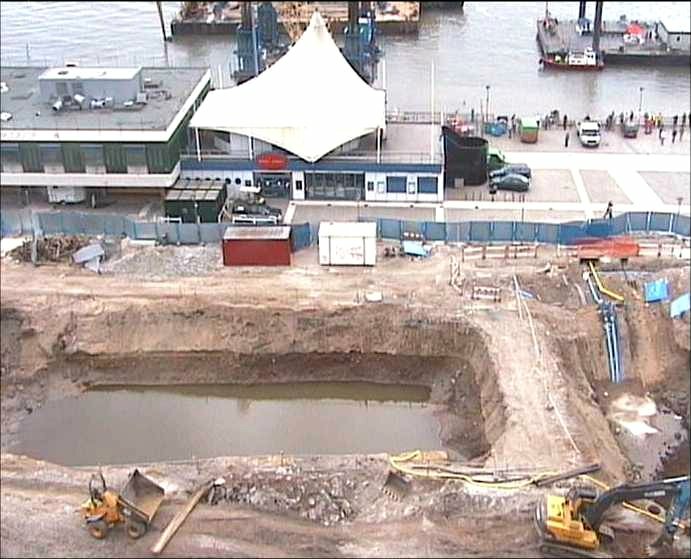 In July of 2003 British Waterways eventually took over ownership and responsibility for the South (non-commercial) Docks Complex and threw their full corporate weight behind development of the proposed waterway. Three plans for the link were unveiled. The first plan utilised an additional river wall constructed outside the existing wall where the new canal would run alongside the River Mersey in much the same way as the Manchester Ship Canal does between Eastham and Runcorn. The second plan utilised a route through the Northern and Central Docks to a boat lift which would elevate craft onto a high level aqueduct running alongside the Strand behind the Three Graces… the Liver, Cunard and Mersey Docks and Harbour Company buildings. This aqueduct would utilise the same route as the Overhead Railway which was tragically scrapped during the mid-1950’s. Another lift at the end of the aqueduct would drop craft down into Canning Dock. The third plan also utilised a route through the Northern and Central Docks via two locks, three tunnels and three cuttings at the Pier Head before entering Canning Basin. All three plans would connect the Northern, Central and Southern Docks which have been isolated from each other since 1898. 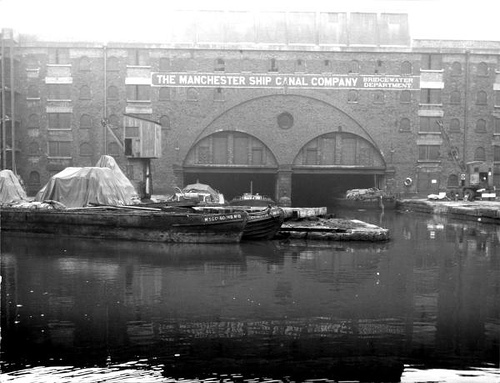 Prior to this date, as previously mentioned, there was a navigable channel suitable for narrowboats and barges connecting Prince’s Dock to George’s Basin and George's Dock which in turn made a connection to Canning Basin. This channel was severed when the George's Basin and Dock were in-filled in order to free-up space for the Mersey Docks and Harbour Board Building. 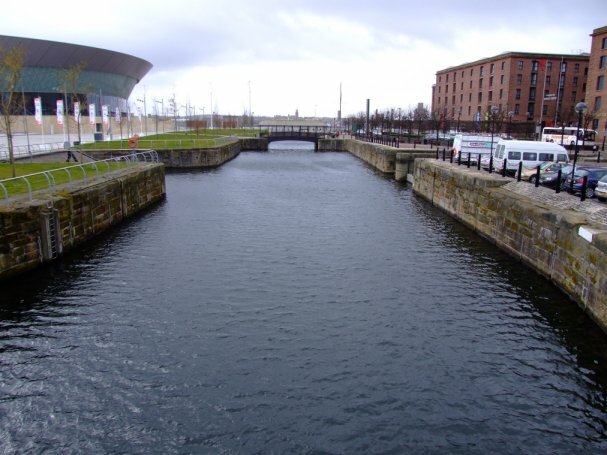 Prior to construction of the Liverpool Link, parts of this channel could still be seen (at Prince's Dock and Canning Basin) but the new link does not use any of the original channel. 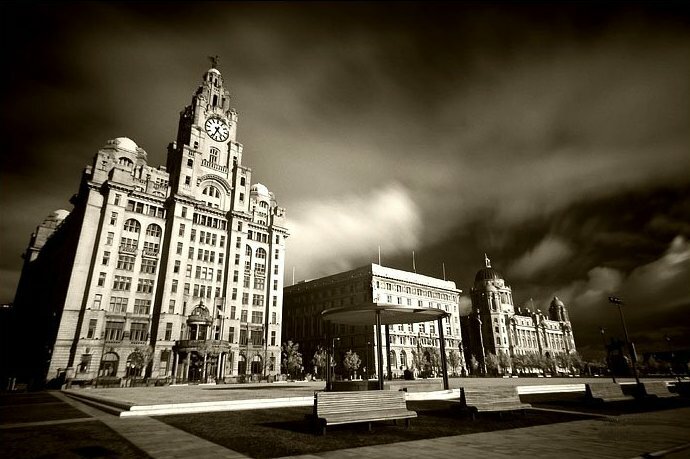 Within ten years of construction of the Mersey Docks and Harbour Building the Cunard Building and Liver Buildings were built on the site of George's Dock. 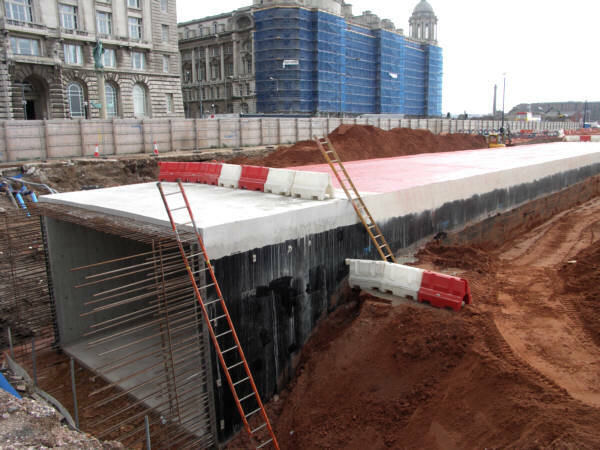 Rather than completely in-fill the basin and dock the foundations of the "Three Graces" as these iconic buildings have come to be known were laid on the bed of the drained George's Dock. Arched galleries supporting Brunswick Street and Water Street, which are located between them, were also built on the floor of George's Dock as illustrated in the photographs below. After a consultation period the third plan was settled upon, plans finalised and funding sought. 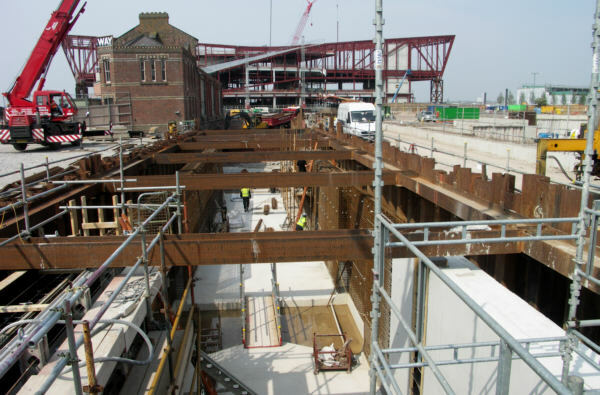 The scheme was given the go ahead in 2005 after the necessary funding had been obtained. 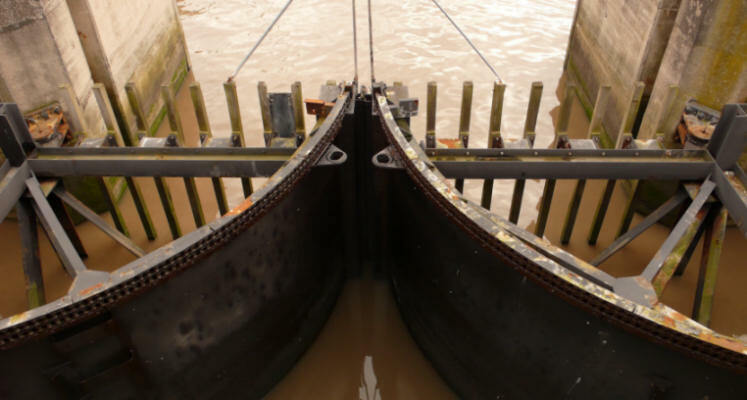 The projected cost of the link was £17 million for one and a half miles of waterway. This was to be paid for by £7.5m from the European Regeneration Funding, £1.7m from English Regeneration Funding and £7.5m from North-West Regeneration Funding. The total cost makes the link... at approximately £10m per mile, the most expensive canal per mile ever built in Britain. 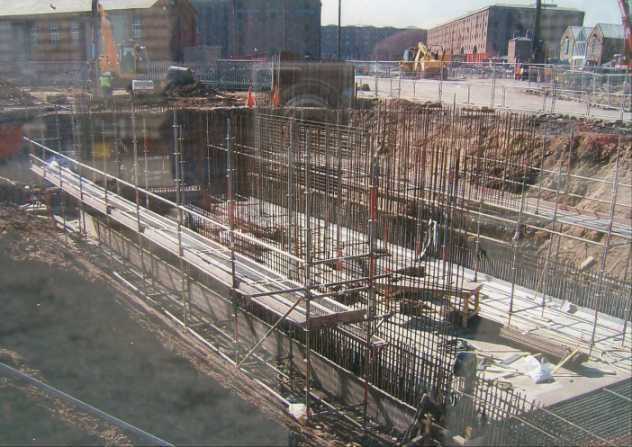 Construction work commenced in May 2006. 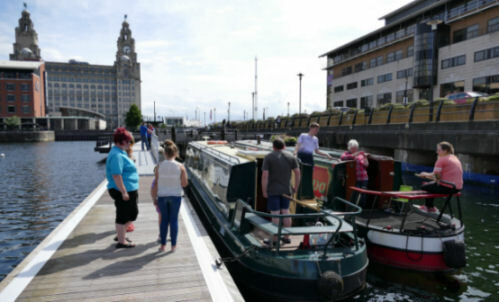 Boats wishing to use the Liverpool Docks Link should make a booking to do so either by telephoning the Canal and River Trust on 03030 404040 or existing C&RT customers can book online by visiting the C&RT Bookings Webpage that can be found at https://www.licensing.canalrivertrust.org.uk/Account/SignIn. 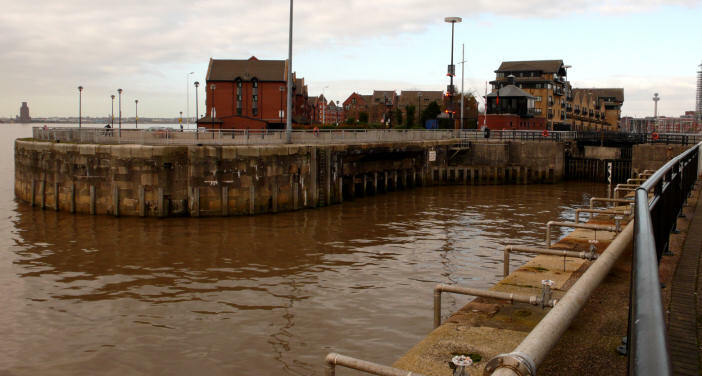 Boaters are advised to arrive with full water tanks and empty toilets (the sanitary station at Litherland is the closest) although facilities are available on the moorings and at Liverpool Marina. If there are high winds passage of the link will be cancelled due to some exposed sections being prone to being affected by high winds. 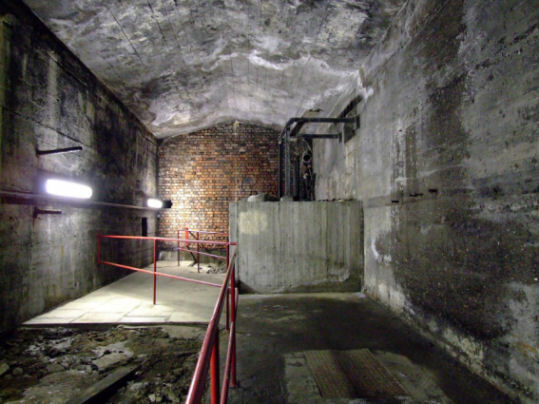 In detail, the route of the Liverpool Docks Link is as follows… On descending the locks on the existing Stanley Dock Branch, Stanley Dock itself is entered via a short tunnel beneath Great Howard Street. Stanley Dock is the only Liverpool dock to be completely constructed inland… the remainder being mainly built on reclaimed land. The dock is surrounded by warehouses... the Stanley Warehouse on the right... now the Titanic Hotel, is reminiscent of the Albert Dock buildings and the Tobacco Warehouse on the left is said to be the largest brick-built building in the World as well as the largest tobacco warehouse in the World. This building has now been restored and converted for multiple use. The scale and strength of construction epitomises the work of Jesse Hartley... the main architect and construction engineer of the Liverpool Docks system. 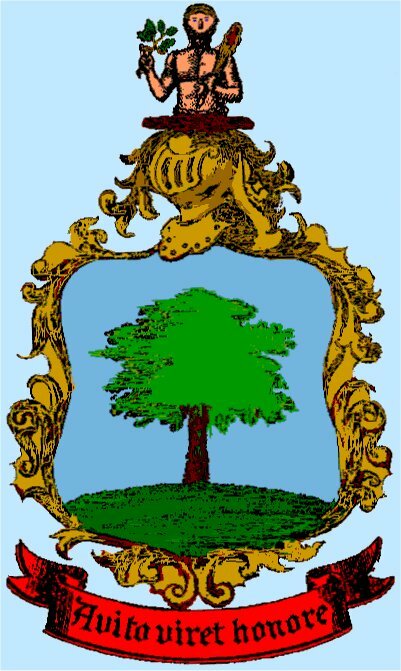 The area is also used as locations for many motion pictures including the Sherlock Holmes movie series (not the BBC TV series starring Benedict Cumberbatch) starring Robert Downey Jr. and fleeting glimpses of the buildings can be seen in many other film and television productions. 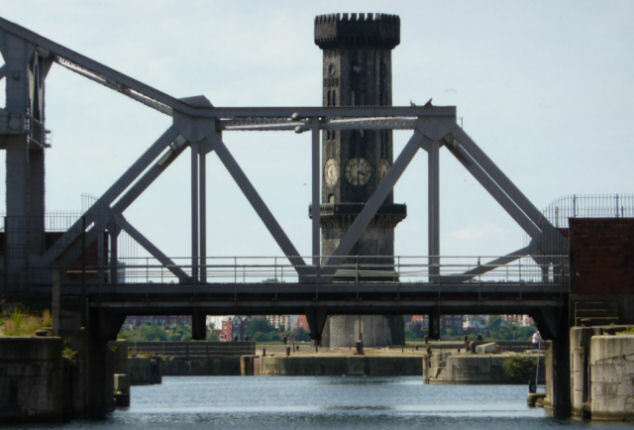 Stanley Dock is exited beneath a large (by canal standards) bascule (lift) bridge which has navigable headroom for canal craft without being lifted. This leads to Collingwood Dock and, via a disused barge lock to Salisbury Dock. The existing barge lock from Salisbury Dock to the river, adjacent to Jesse Hartley’s Octagonal Clock Tower is to be rebuilt allowing an alternative river access for larger craft. A left turn into Trafalgar Dock is made and the two Clarence Graving (dry) Docks passed on the left. 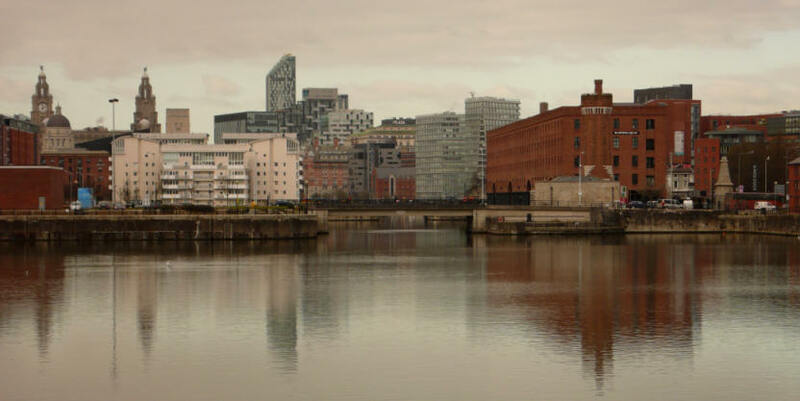 Adjacent to the graving docks was once located the Clarence Dock Power Station with its three tall chimneys christened locally as “The Three Ugly Sisters” or the "Cricket Wickets" which were landmarks that could be seen for many miles around. The power station was built on part of of the in-filled Clarence Dock and later part of Trafalgar Dock was in-filled using the debris from the eventual demolition of the power station and the “Three Ugly Sisters”. 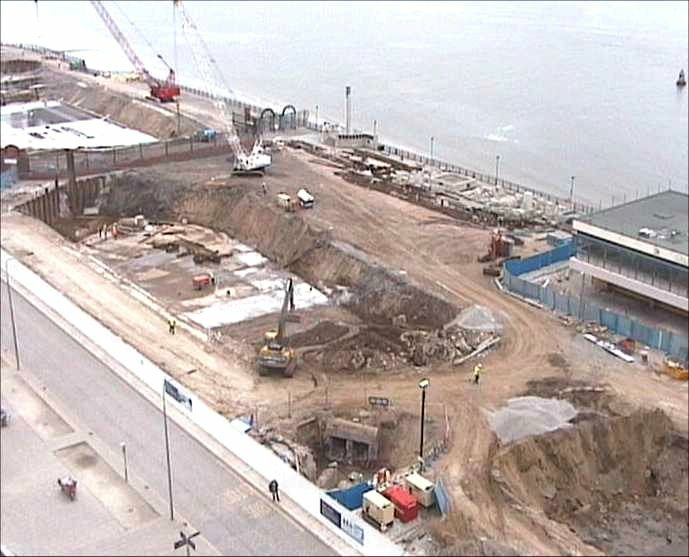 It is here that the new portion of the waterway commences. 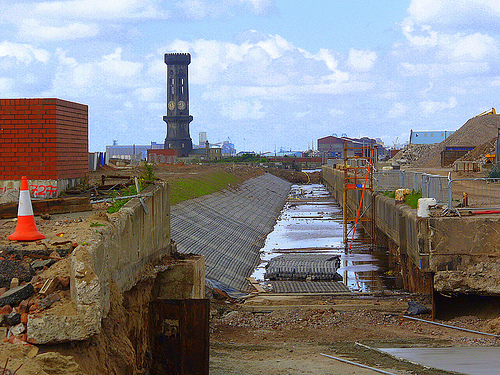 When the dock was in-filled a five foot wide feeder culvert was retained and this feeder has been increased in width to thirty three feet to allow for navigation and renamed the Central Docks Channel affectionately known as Sid's Ditch after a member of the Canal and River Trust Liverpool Link Team. This channel runs beneath Bridge AA and into West Waterloo Dock with South Waterloo Dock running parallel to it. The sign at the Entrance to "Sid's Ditch"
After this is Prince's Half Tide Dock and the route ducks below the new Prince's Dock Causeway - Bridge BB and then into Prince's Dock. After cruising two thirds of this dock is the futuristic Prince's Dock Foot Bridge - Bridge CC, which has had to have been raised when the Liverpool Link was constructed to allow for an eight foot navigational air draft. 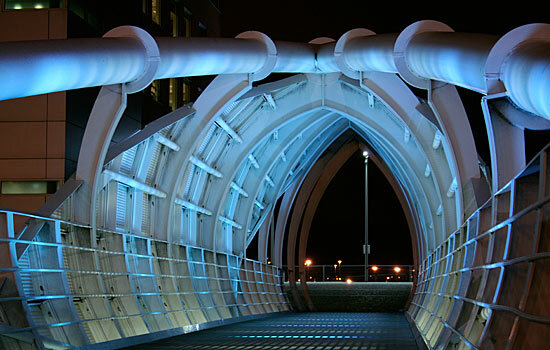 The link exits Princes Dock through Prince's Lock which lowers the level of the canal about a metre before it ducks beneath the area in front of St Nicholas Place (the location of the in-filled George’s Basin) now known as St Nicholas Tunnel which is two hundred yards long. 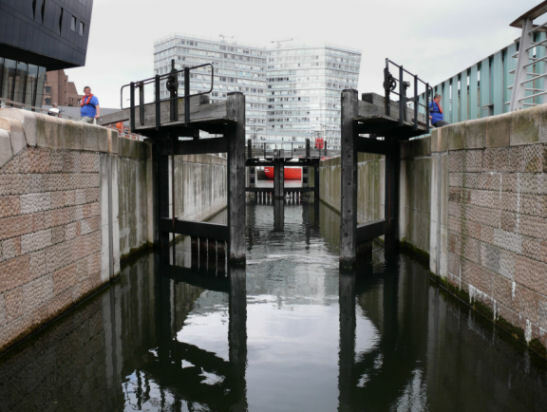 The Leeds and Liverpool Canal style lock gates look a little out of place in the docks environment but realistically, one would not expect any other pattern to be used here. 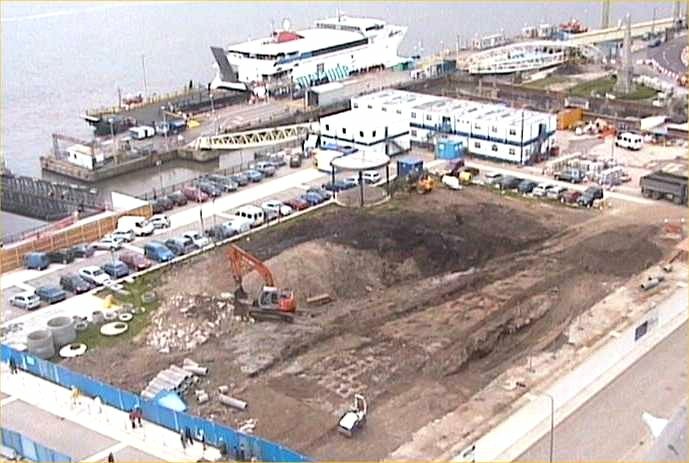 There is to be a new building development in front of the historic “Seamen’s Church” of St Nicholas and the Titanic Memorial has been moved to adjacent the Cruise Liner and Manx Ferry Passenger Terminal entrance where the Link emerges into the shallow cutting known as Liver Basin in front of the Liver Building. 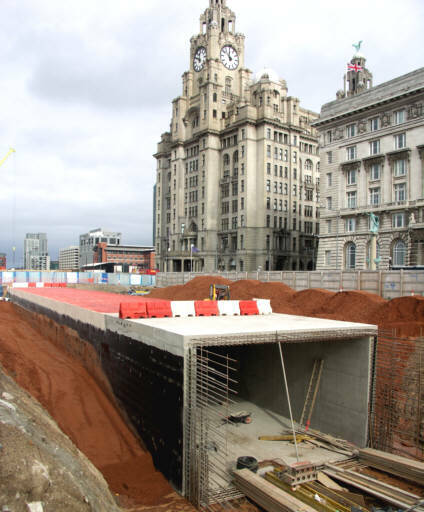 The new canal passes through the short Cunard Tunnel and emerges into the cutting in front of the Mersey Docks and Harbour Company buildings (the other two of the Three Graces) alongside Canada Boulevard before entering the Museum Tunnel beneath Mann Island. After the open cutting the canal enters the Museum Tunnel in front of the Cunard and Mersey Dock Board Buildings. 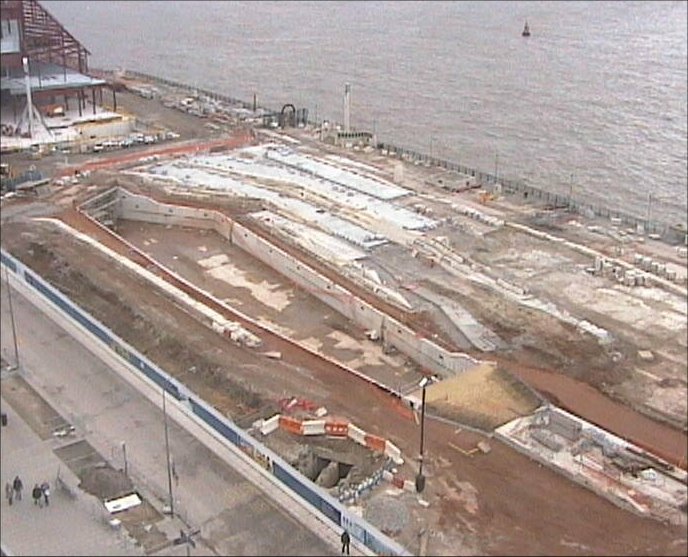 When the waterway emerges from this tunnel it enters the Mann Island Basin adjacent to the Museum of Liverpool and features an open air Amphitheatre. This basin is where craft wait to use the reversible Mann Island Lock. 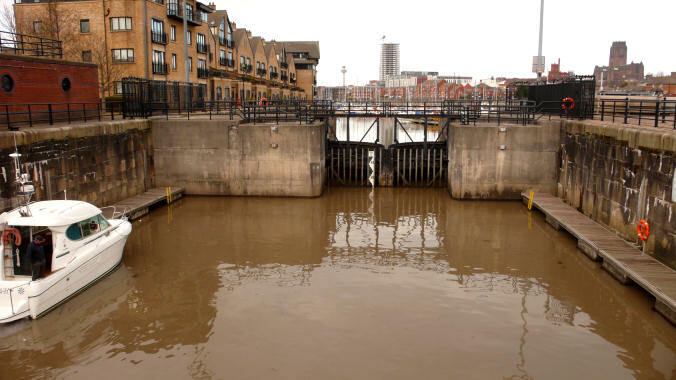 The reversible Mann Island Lock possesses dual gates at the Canning Basin end and will either lock up or down depending upon water level in Canning Basin. The level of Canning Half Tide Dock (and hence Canning Basin) can vary due to the river entrance being a single lock gate as against a "proper" lock possessing head and tail gates. 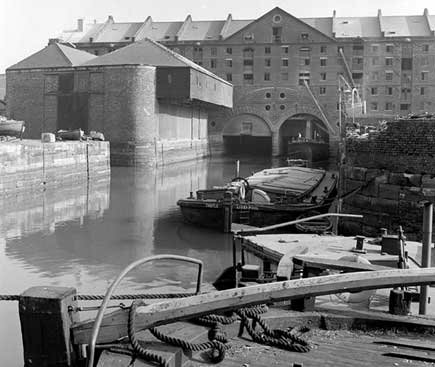 After entering Canning Basin and passing the Graving Docks on the right the route turns sharp right through the entrance gates to Canning Half-Tide Dock, along the dock to the entrance to Albert Dock on the left. 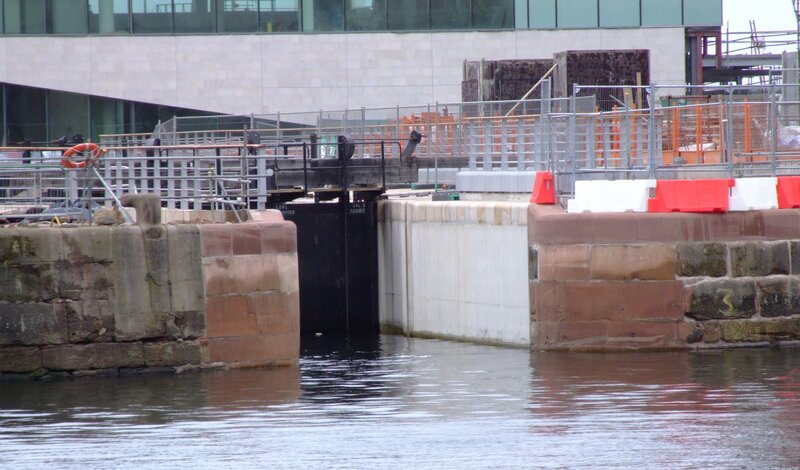 The lock gate that gives access to the River Mersey is straight ahead but there is another, mostly hidden lock gate at the entrance to Albert Dock. 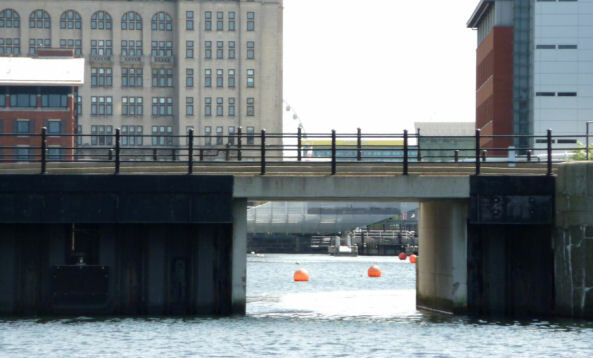 This gate is a dropping gate known as Jesse Hartley's Gate and ensures a constant water level in Albert Dock and the remainder of the South Docks. 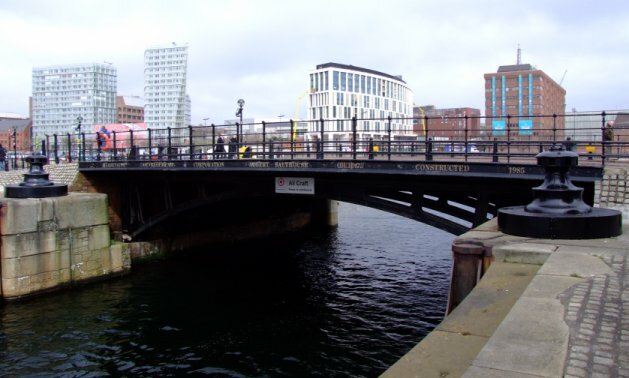 Once in Albert Dock, it is crossed diagonally and exited beneath the cast iron bridge which gives access to Salthouse Dock. New additional pontoon moorings were installed in Salthouse Dock in 2015 all of which have water and electricity points provided on them. Electricity cards can be obtained from the Albert Dock Tourist Information Centre located in Anchor Courtyard on the southern end of Albert Dock. 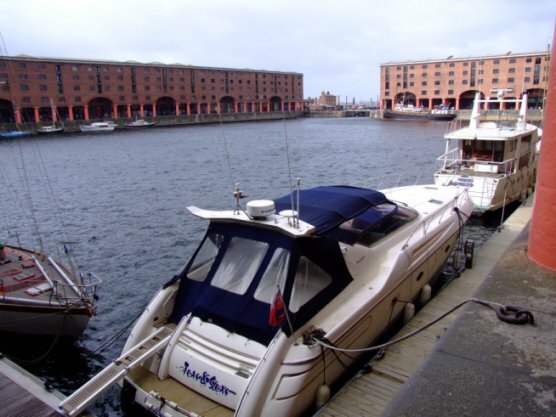 Boaters are encouraged to arrive with empty toilet cassettes and holding tanks but facilities for emptying toilet cassettes are available by arrangement at Liverpool Marina. Telephone 0151 707 6777 to make arrangements to use this facility which may incur a charge. The route leave Salthouse Dock and passes Duke's Dock on the right. This was originally constructed for Francis Egerton... the Third Duke of Bridgewater to accommodate Bridgewater Canal barges (known as "Dukers") towed from the Bridgewater Canal terminus at Runcorn (and after 1898 along the Manchester Ship Canal) down and across the River Mersey to Liverpool. 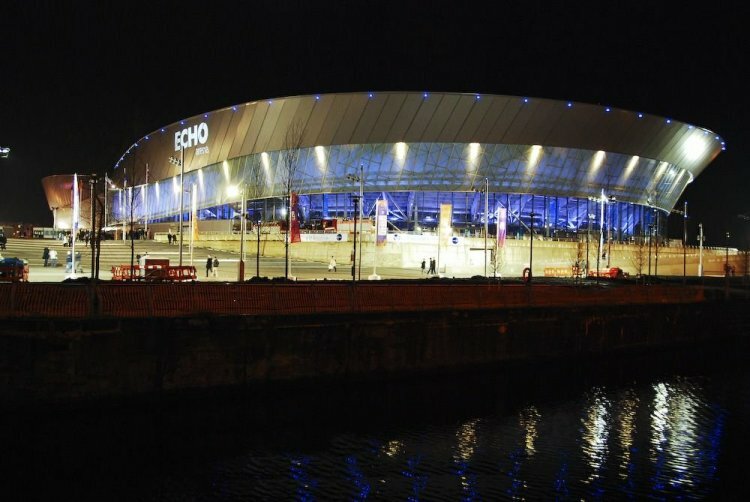 The warehouses have long been demolished and is now the location of the Liverpool Echo Arena and the BT Conference and Convention Centre. The dock also possessed its own river entrance but this has also been filled-in. The next dock is Wapping Dock followed by the King's and Queen's Docks before reaching Coburg and Brunswick Docks. 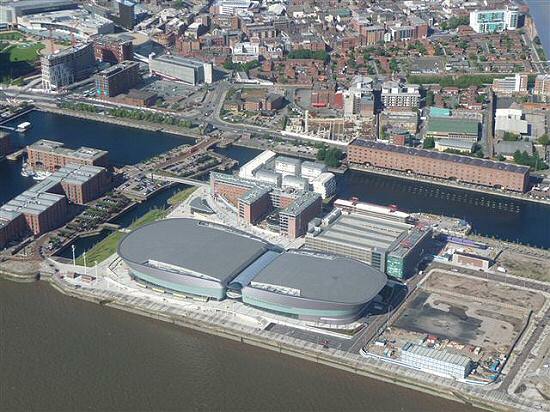 The latter two being the location of Liverpool Marina. Brunswick Dock is the last remaining dock on the South Docks system... there were others beyond it but they have been in-filled and built over.  There are, however, a couple of docks further south at Garston but they are not, and never have been connected to the main dock system. All Inland waterway access to Liverpool Marina is via Wapping and Queen's Docks, but when you reach it you will be taken by surprise by the size of it... it's huge, and that is just the first section in Brunswick Dock. There is another section in the adjacent Coburg Dock that is just as big and a planned extension to the Marina will utilise more space in Brunswick Dock. There is also toilet cassette emptying facilities (but no pump-out) located within the Marina at the fuel berth in Coburg Dock (named after the original British Royal Family name of Sax-Coburg) and arrangements to use this facility can be made by telephoning 0151 707 6777. Directions as to where the fuel berth in Coburg Dock and other facilities are located will be given at that time. 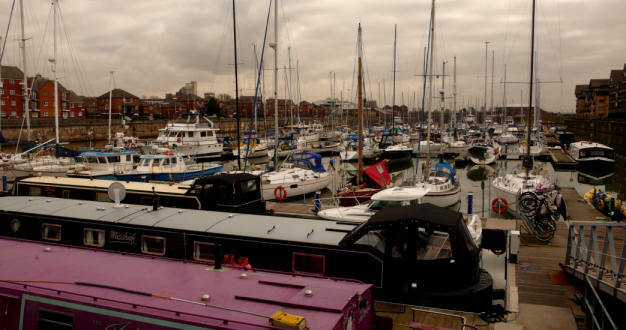 The Marina is also home to Liverpool Yacht Club which has a bar, restaurant (telephone 0151 707 6777 to make a reservation) and other amenities for boaters. There is also a boatyard and boat chandlers operated by Blue Point Marine who can be contacted on 0151 708 2857. 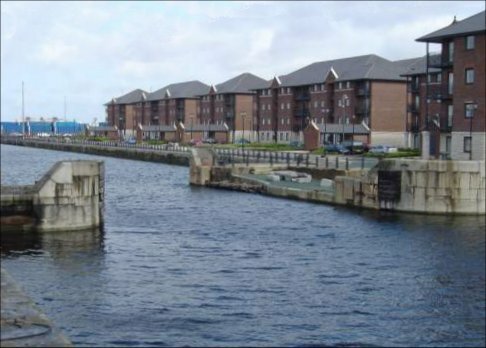 At the far end of Brunswick Dock, just past Liverpool Marina is Brunswick Lock that gives access to and from the River Mersey. This lock is quite unusual as it has a near square chamber spanned by a lift bridge and lock gates that are semi-circular in design. This entrance lock gives access to the river for sea-going craft not wishing to use the link or too wide (or deep drafted) to pass through the locks on the new canal. The entrance lock would also give the adventurous canal boater a more direct route to the Manchester Ship Canal Entrance Locks at Eastham on the Wirral Peninsula (further upstream on the opposite bank of the river) at a point where the tidal race is not as fast as it is downstream at the "narrows". The lock is usually staffed between 05.00 and 22.00 but the state of the tide dictates the times that the lock can be used. 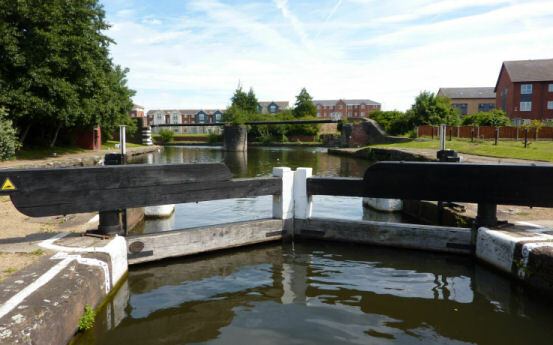 The lock can be booked for use outside the normal opening times. Telephone 0151 707 6777 for more details. 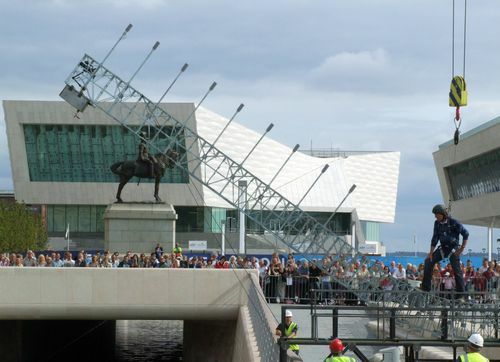 Liverpool achieved the European City of Culture 2008. The legacy of this, plus its many attractions will make it a popular destination for boaters. The Albert Dock is Liverpool’s Premier tourist attraction and is home to the Tate Gallery (the benefactor of which, part-owned the previously mentioned sugar refinery), Liverpool Maritime Museum, the new Museum of Liverpool, the Beatles Story, the Liverpool Echo Arena and the BT Conference Centre. 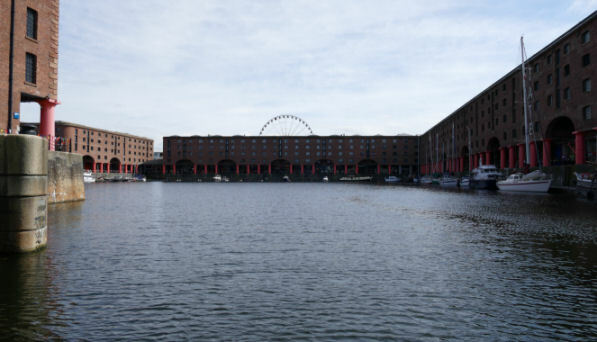 Not only does the Albert Dock complex accommodate these attractions but it also contains shops with many types of designer retail outlets in addition to many theme pubs and restaurants. 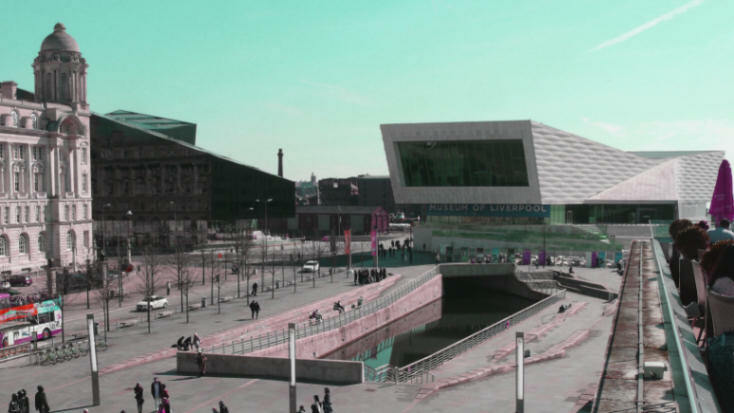 The Liverpool One Shopping Centre is "just over the road" which is located on the site of the Old Liverpool Dock or Thomas Steers' Dock opened in 1715. 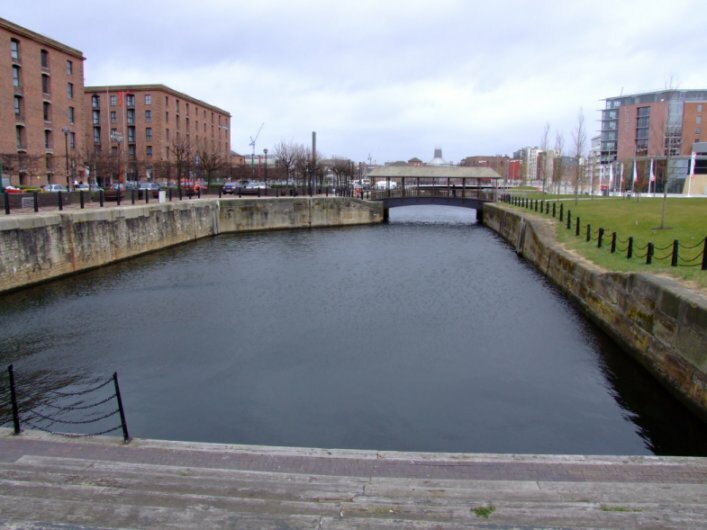 As well as being the first dock to be built in Liverpool it was the World's first commercial wet dock. 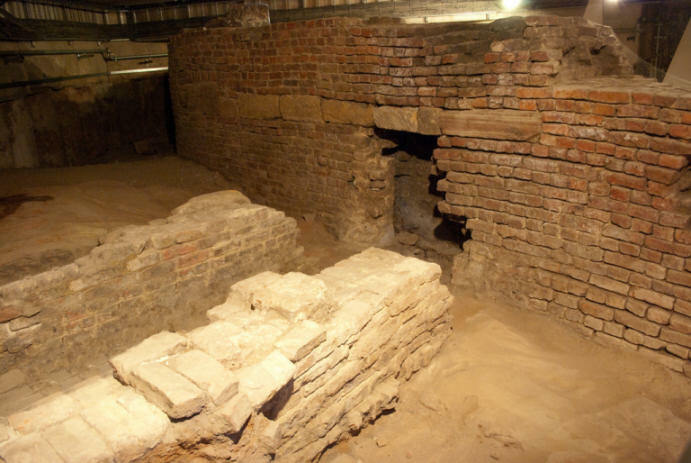 Part of the Old Dock is preserved beneath Liverpool One shopping centre and the Liverpool Maritime Museum regularly hold conducted tours of the dock. Tour information and bookings telephone number is 0151 478 4499. Canal enthusiasts may be interested to note that Thomas Steers was also responsible for the building of the Mersey and Irwell Navigation. 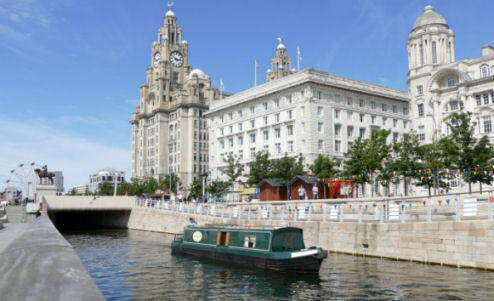 Adjacent to the Pier Head is the new Liverpool Terminal Building and Floating Landing Stage of the historic Mersey Ferries, the new Princes Landing Stage Cruise Ship Terminal and the Liverpool Museum of Life. Not too far away are the well-established "conventional" shopping area and the city centre with its own attractions such as the Walker Art Gallery, Liverpool Museum and St George's Hall not to mention several theatres. 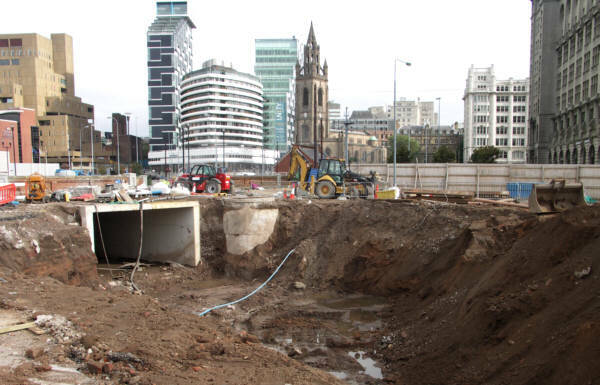 Not long before the Liverpool Link was due to open, British Waterways had completed dredging the length of the Leeds and Liverpool Canal that threads its way through the city. 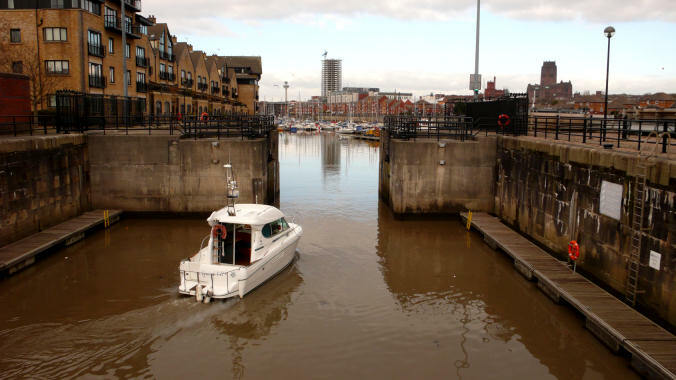 They have also provided twenty two floating pontoons in Salthouse Dock to ensure sufficient moorings are available for the large number of boats expected to use the Liverpool Link. These pontoons provide moorings for up to forty four boats and are serviced with water and electricity. In the Southern Docks is located the previously mentioned Liverpool Marina. 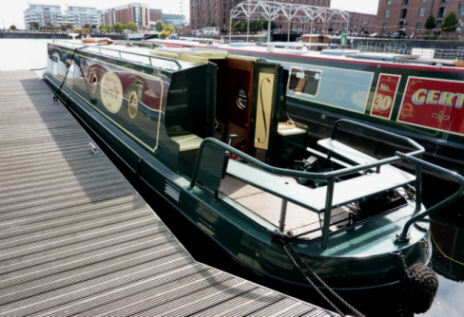 Originally, Marina previously concentrated on providing moorings for river and sea going craft but, with the construction of the Liverpool Docks Link, now provides both temporary and permanent moorings for canal boats in addition to the berths currently used by sea-going craft and yachts. The marina is situated in the Brunswick and Coburg Docks and is surrounded by an up-market housing and business development. More marinas have been constructed locally along the Leeds and Liverpool Canal, the nearest being at Scarisbrick. 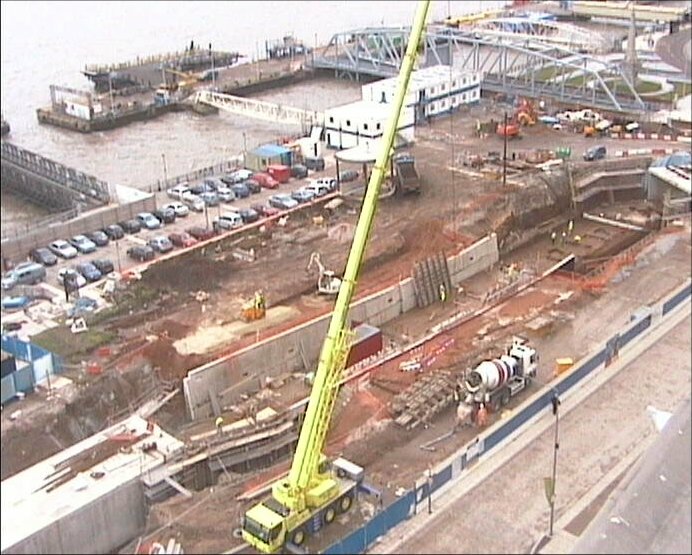 Construction of the link commenced in May 2006. 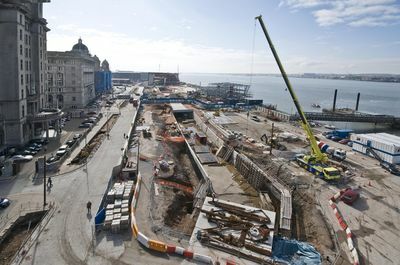 The majority of the construction works on the new length of canal was completed by the summer of 2008, the major construction work completed with the Pier Head section in front of the Three Graces filled with water (but not navigable) in October 2008 with the West Waterloo Dock section following in December. 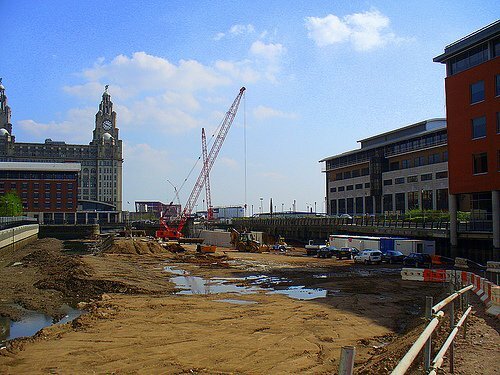 The canal was not scheduled to be opened for boats until April 2009 due to the close proximity to the Pier Head section to the Museum of Liverpool and the Mersey Ferry Terminal Building construction sites. Health and safety risk assessments deemed the area not to be a safe environment for the large number of visitors anticipated at the opening of the link. 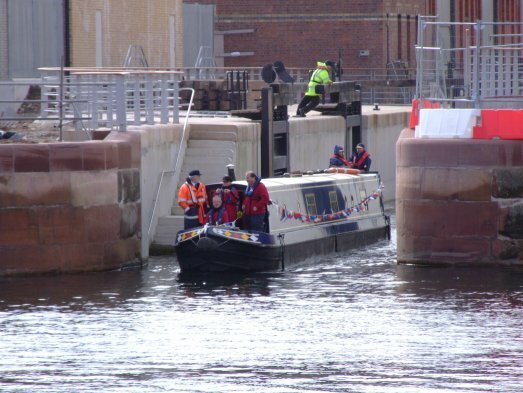 On the 20th February 2009 BW's work boat "Aintree" became the first boat to navigate the link prior to the official opening ceremony. The Chief Executive of British Waterways... Robin Evans and Councillor Steve Rotheram... the Lord Mayor of Liverpool performed the opening ceremony aboard the "Pride of Sefton" which was the first boat through the link at the official opening ceremony on Wednesday 25th March 2009. 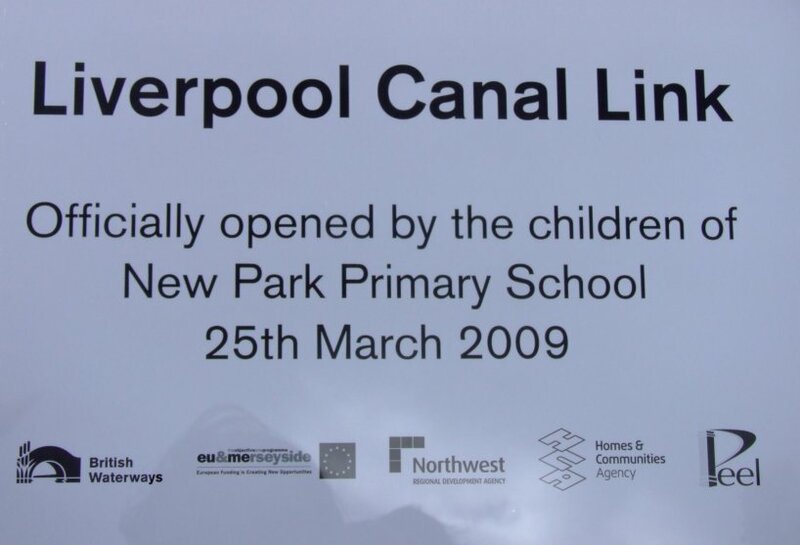 Children from New Park Primary School in Liverpool unveiled a plaque commemorating the opening of the Link. 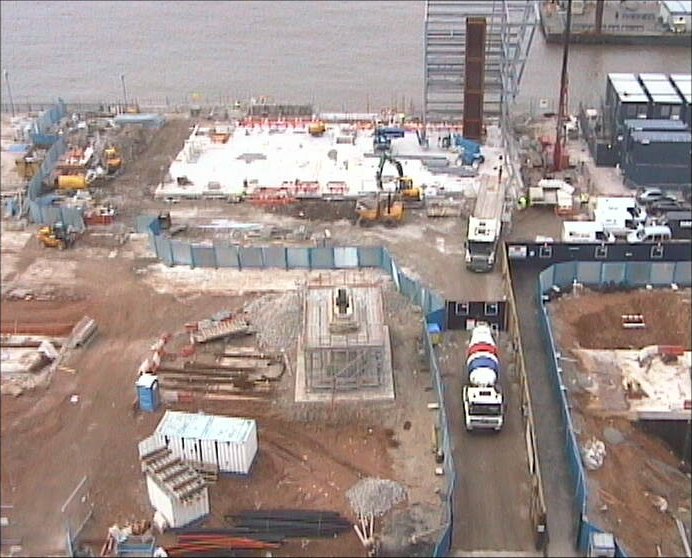 Even though the Link had been officially opened, craft were not allowed through it until after Easter when some of the construction work besides the new Mersey Ferries Terminal was nearing completion and construction work surrounding Mann Island Holding Basin and lock had reached a stage where canal traffic could pass in safety. James May preparing to cross the Meccano Bridge erected across the Liverpool Link for the BBC2 TV series "Toy Stories"
On 8th August 2009 television personality James May crossed the new canal on a 23 metre long Meccano bridge constructed by engineering students from Liverpool University using over 100,00 Meccano pieces. 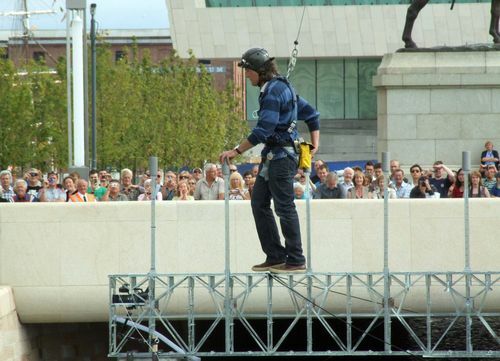 The temporary bridge, which is a combination of bascule and swinging components, was erected in front of the Liver Building on Liverpool's historic Pier Head for the BBC2 TV series "Toy Stories" which makes life-sized comparisons between toys and real-life objects. With Frank Hornby's (now demolished) Binns Road "Factory of Dreams" in Liverpool being the birthplace and home of Meccano (as well as Hornby Dublo Model Trains and Dinky Toys) for over seventy years it seemed fitting to construct the bridge within the city. James was originally going to drive across the bridge in a car but he later declined saying that the bridge was built in the wrong scale! 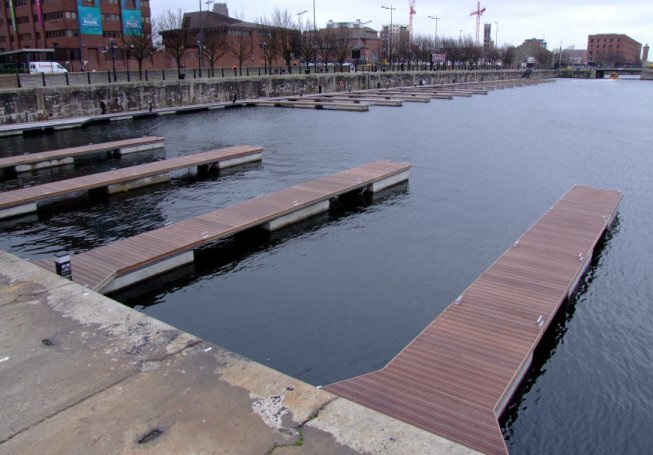 Since the Link was opened, additional pontoons have been installed in the Albert Dock to accommodate the first Liverpool Boat Show in April 2011. Unfortunately, the Boat Show was cancelled a few months before it was due to take place with the financial recession being blamed for many exhibitors pulling out and the organisers going into liquidation. In the end a down-scaled event renamed Spring on the Waterfront, Liverpool, took place over the weekend of the Royal Wedding (28th April 2011) and lasted for nine days. 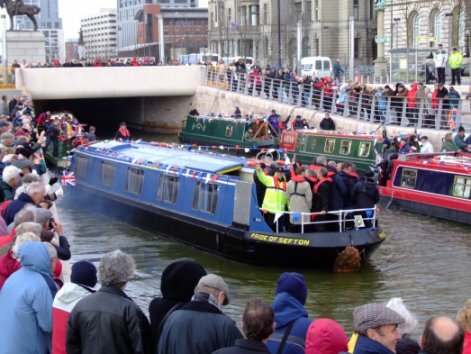 In addition to the Historic Narrowboats and other canal-related activities the event incorporated a Sea Shanty Festival, Tall Ships and other maritime attractions and the only steam fair to be held in a city... Steam on the Dock. The continuation of the Leeds and Liverpool Canal’s route to its new terminus will give the canal an added focus and a more readily identifiable terminus to the canal. 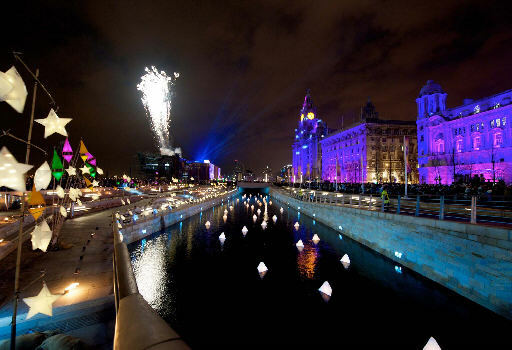 Projected forecasts envisage up to fifty boats per day using the Link during the annual Mersey River Festival and at the height of the canal boating season which equates to approximately 4500 boats per year. 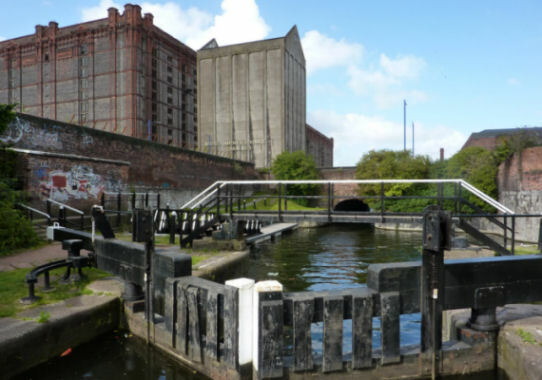 The dock complex will also be used as a location for large boat gatherings, rallies and even a Liverpool Boat Show which, in turn, will all boost the amount of traffic on the canal below Wigan. 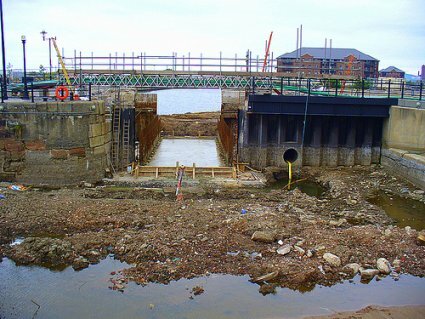 The new route also includes restoration of Salisbury Dock Barge Lock adjacent to Jesse Hartley's Octagonal Clock Tower (currently disused). 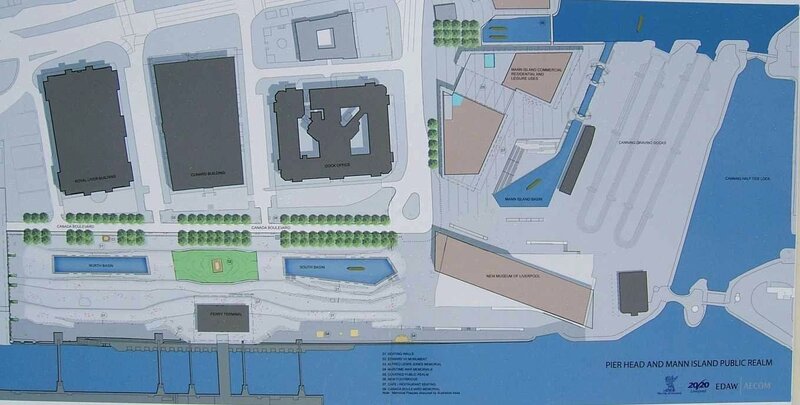 This would provide an additional entrance to the river for larger craft not able to cruise through the new canal or enter the docks through Brunswick Dock. 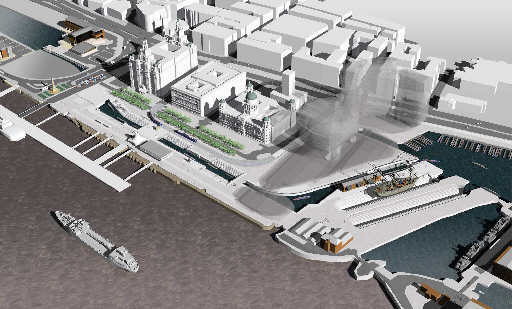 This would alleviate the need for craft wishing to enter the river having to cruise north through the commercially used North Docks to the (previously used) Langton Dock river entrance a couple of miles upstream of Stanley Dock. Here craft would lock down into one of the busiest (commercially) sections of the river and “double back” into the third fastest tidal current in Europe… which you must agree is not an ideal environment for narrowboats and other canal craft. There is usually a long waiting list of boats waiting to navigate the link and passage has to be booked well in advance (contact the C&RT Bookings Team on 03030 404040 for details). The total cost of the link was twenty two million pounds and with the high number of canal boats using the link plus when the Liverpool Boat Show eventually gets off the ground, hopefully using the Albert and surrounding docks as a location for this event, plus the other events requiring canal access to the docks, this has proved to be money well spent! So You Want To Go Canal Cruising?